If you’re thinking of a classic Curious George Birthday for your little one’s celebration, check out the fun, creative details in this party! You are seriously going to go BANANAS over this super adorable Curious George Birthday Party for a very lucky three-year-old boy! 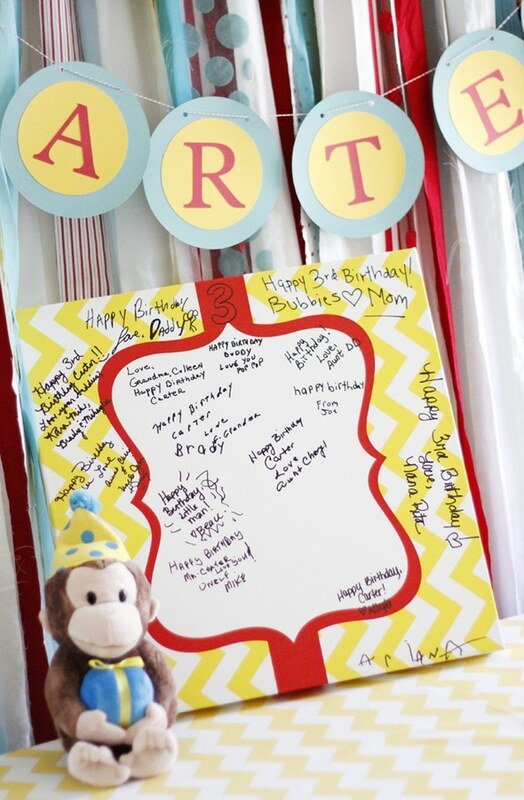 Curious George has been a popular kids birthday party theme for years. Who doesn’t love the adorable monkey Curious George, right?! Kids go bananas over the Curious George books and the animated series that still plays on television today! 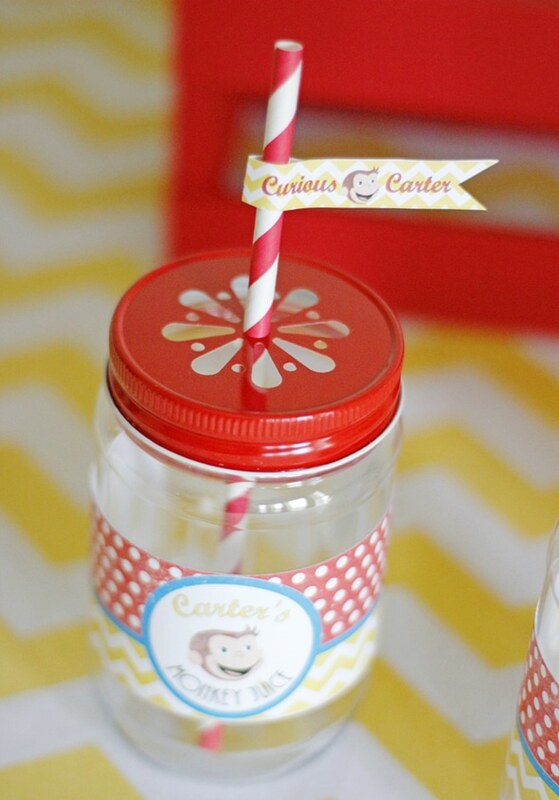 The Curious George birthday theme is perfect for a first birthday or a third birthday. There are so many creative ideas you can do with this monkey theme that’s full of bright, cheery colors. If you’re ready to stop monkeying around and start planning an awesome birthday party, we’ve got you covered with this awesome Curious George Birthday! 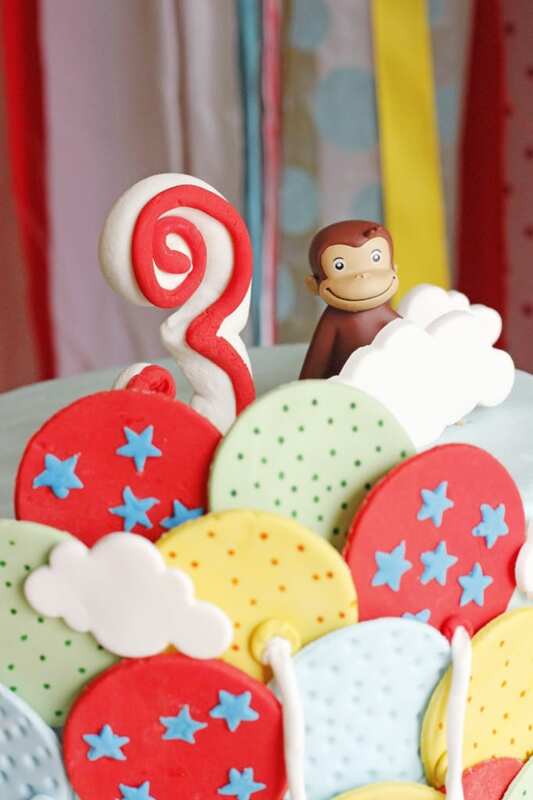 The idea behind this Curious George Birthday was to add a fun and modern take on the classic monkey. The colors for this bright and cheery Curious George Birthday were red, teal and yellow. The colors and patterns used throughout the party really made this theme pop! The dessert table features a modern yellow chevron tablecloth. The dessert table backdrop was made of different fabric pieces that were made to match the color scheme. The Curious George Birthday Party, appropriately named, Curious Carter after the birthday boy, was centered around the dessert table. 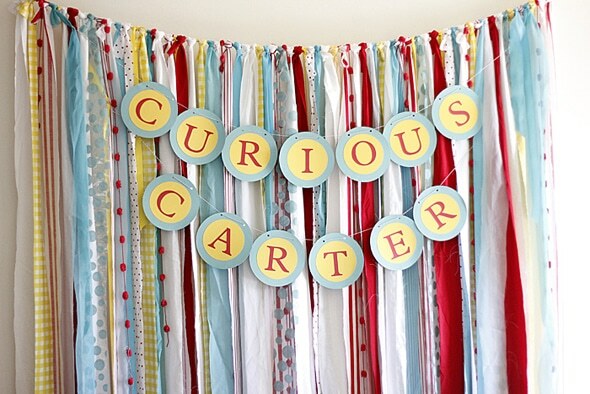 A Curious Carter banner from Ella and Annie hung across the fabric backdrop and matched perfectly! The awesome fabric backdrop was made by oh MY CHARLIE. Fabric backdrops are our favorite! They are so easy to hang and look great behind any dessert table. 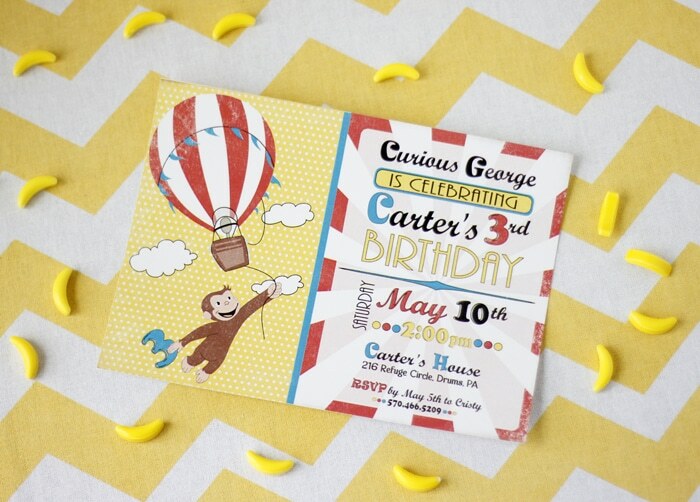 Grace & Guy Paperie & Design Co. designed the Curious George Birthday Invitation and all of the matching party printables. The Curious George Birthday Printables really set the tone for the whole celebration. Funky Monkey Designs did an awesome job of designing this Curious George Birthday chalkboard sign. 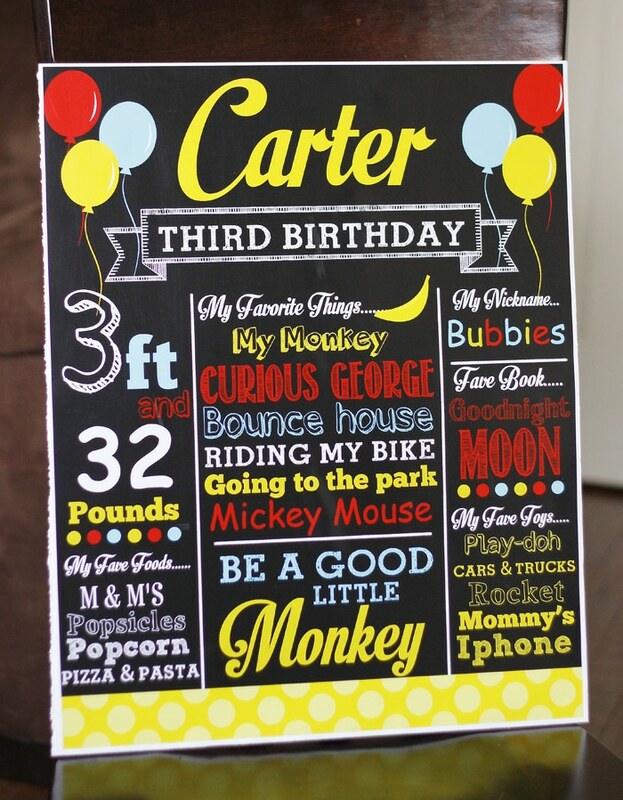 The chalkboard sign is a really great way to personalize the party for your child and show your guests what your child’s favorite things are. It’s also a great keepsake too! Another great idea for a Curious George Birthday is to have party guests sign a themed book with a sweet message for the birthday boy! 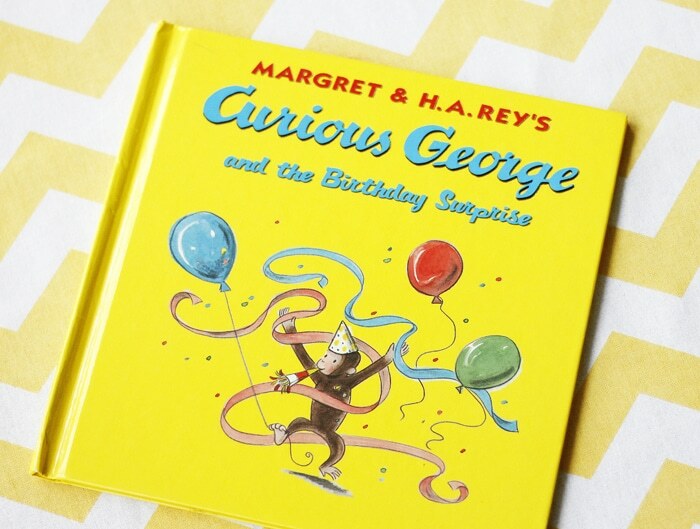 This Curious George Birthday Surprise book was perfect for the party theme and makes a wonderful keepsake forever. What a great book to add to the little one’s collection! Let’s Go Bananas! 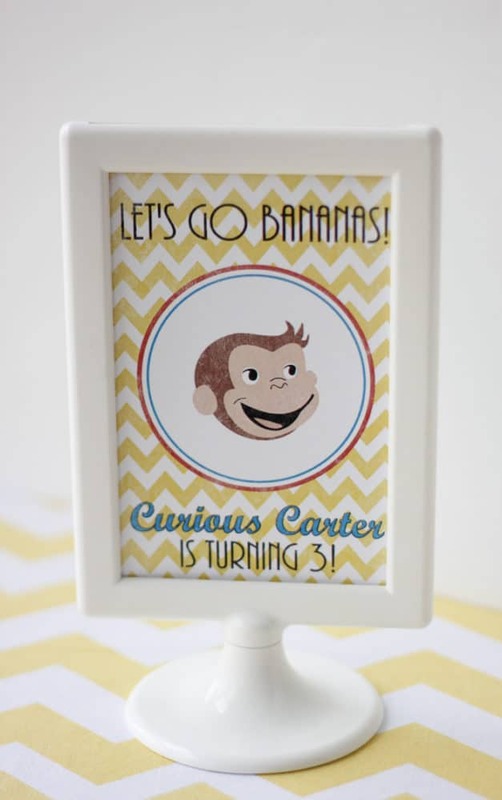 This Curious George Birthday Sign made a great addition to the party table and tied in nicely with the other party supplies and decorations. 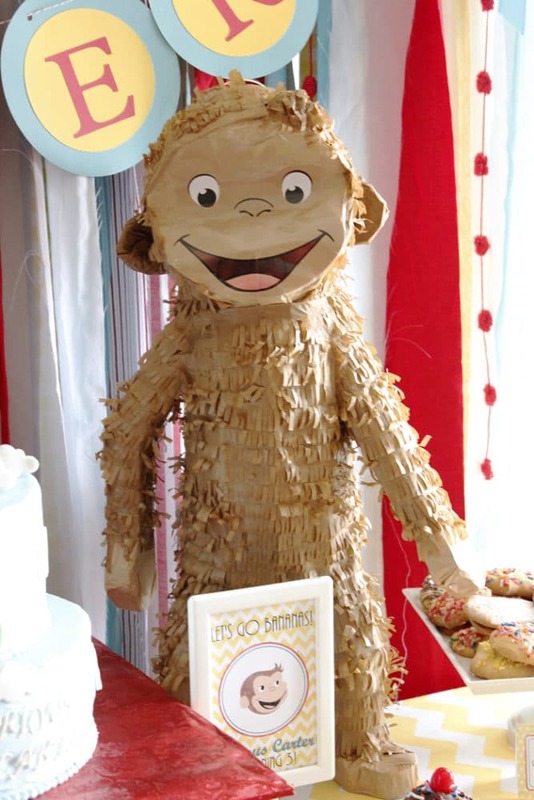 The Curious George Birthday monkey pinata was too cute and worked perfectly as a decoration on the dessert table! You don’t always need to fill and break the pinata, right?! If you find one that works great as a party decoration, then add it to your party supplies like the one here. 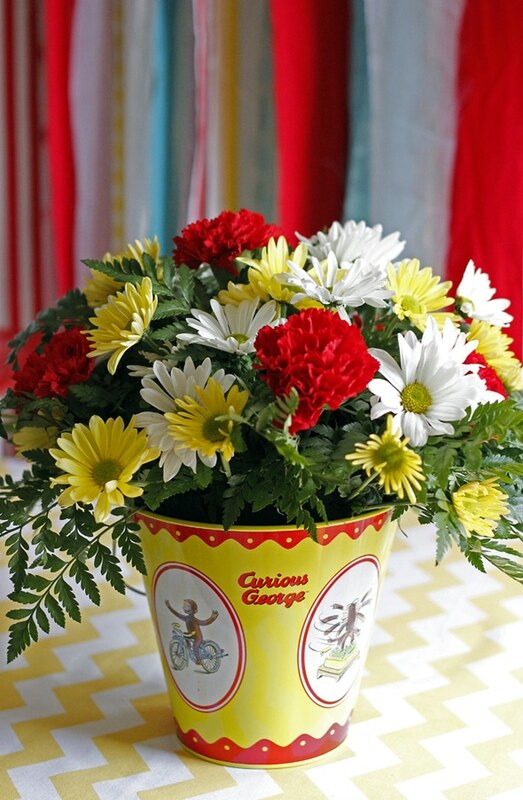 We LOVE these classic Curious George tin buckets that were used as flower table centerpieces for the party! Coordinating flowers from a local florist added them into the buckets and were a hit with the guests! 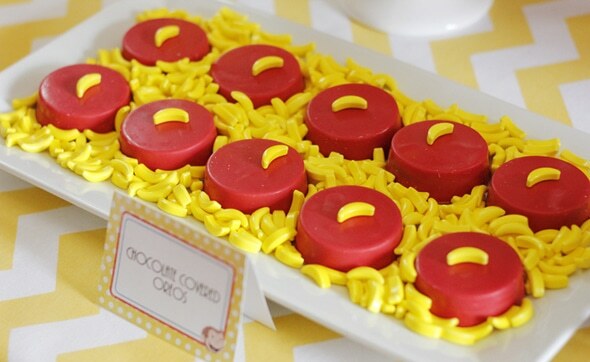 What a great Curious George Birthday idea! 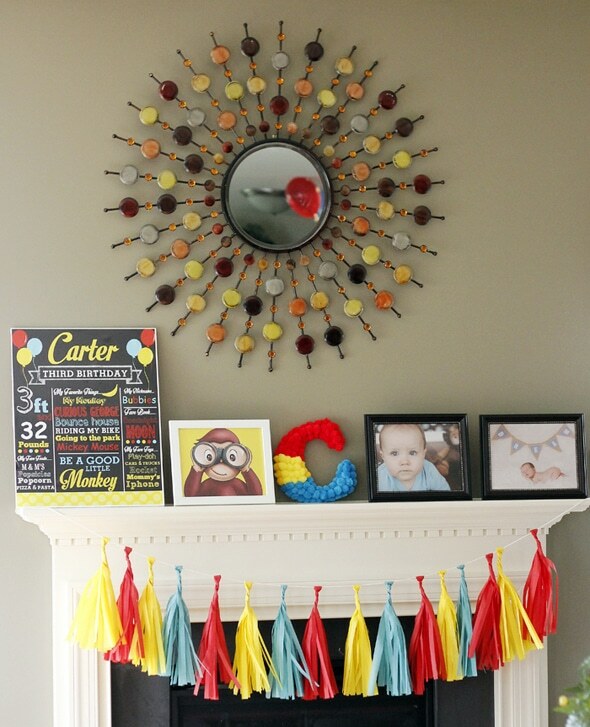 A color coordinating tassel banner from the Flair Exchange looked perfect across the fireplace mantel. You can mix and match any colors you like! There’s was also an easy DIY party decoration project for this party too! 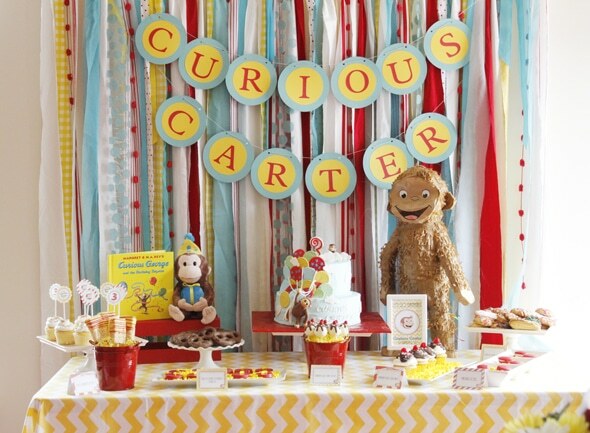 The red, blue and yellow pom letter looked great with the other Curious George Party Decorations! For this project, all you have to do is get a wooden letter from Michaels or any other craft store and glue poms in coordinating colors. It was a cheap and easy DIY party decoration and it looked great on the fireplace mantel don’t you think?! WOW! 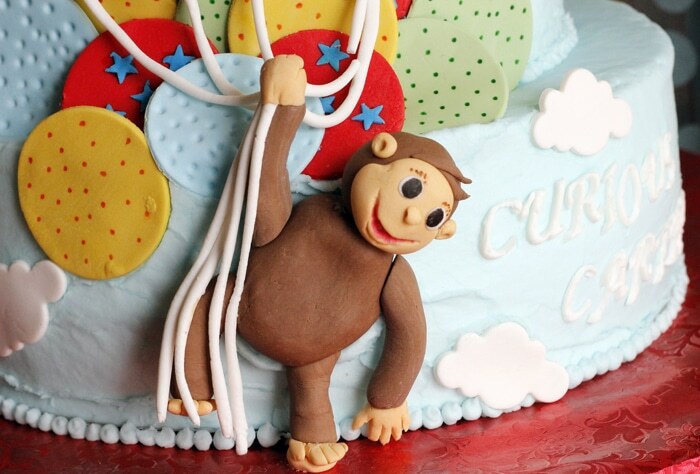 How adorable is this Curious George Cake?! The cake was a two-tiered light blue birthday cake that featured a monkey holding balloons in coordinating colors. The birthday cake also featured white clouds and “Curious Carter” on the bottom layer. 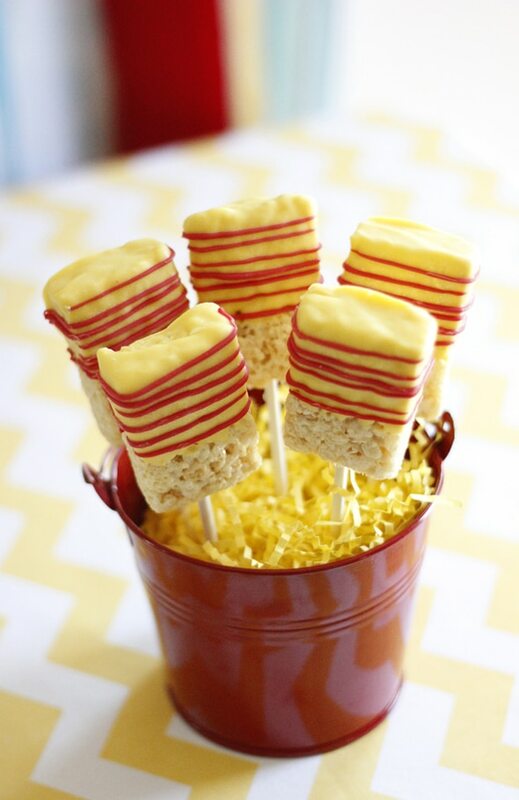 What a great design to do with this well though out Curious George Birthday! And if you look closely, you will see the adorable Curious George cake topper next to the number three behind the cloud. We are sure the birthday boy’s face lit up when he saw his awesome birthday cake! 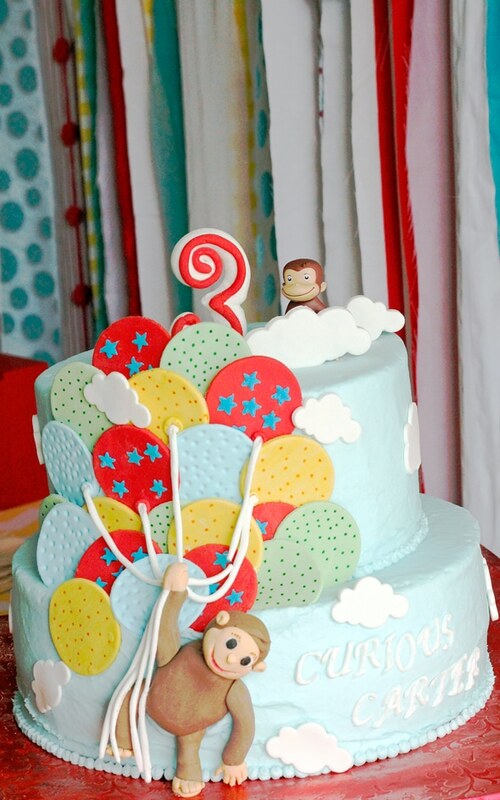 The balloons cascading down the Curious George Cake were made of fondant and matched the colors of the party. Seriously, how perfect is this cake design?! The monkey on the cake was also made of fondant. What a perfect cake for a fun Curious George Third Birthday Party! If you’ve ever wanted to taste the most amazing cupcakes in the world, these Banana Split Cupcakes are it! 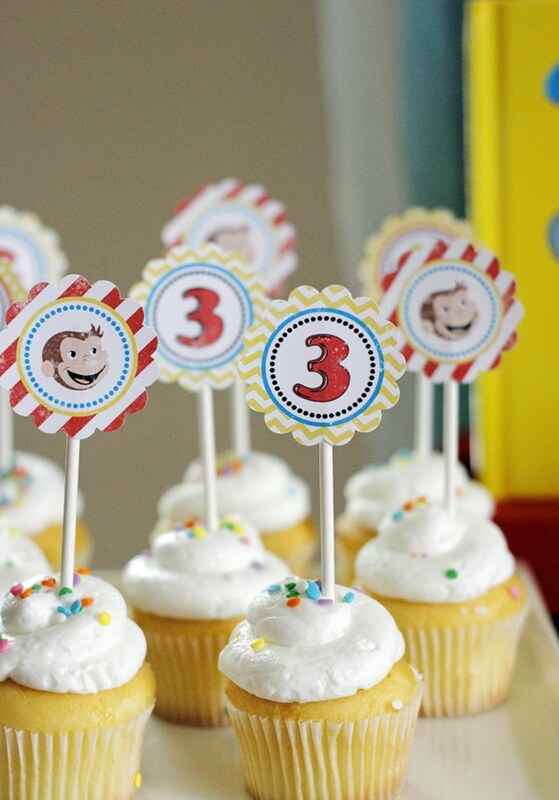 We love how the bananas and banana cupcakes were incorporated into the Curious George Birthday Theme! 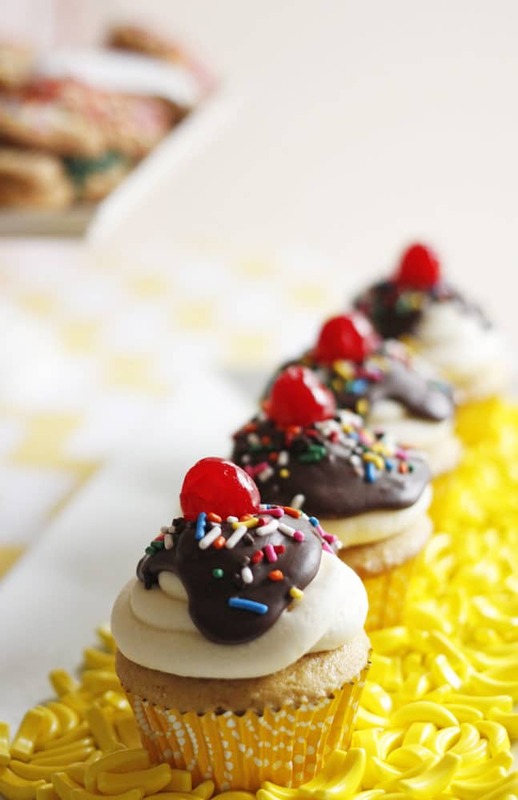 Little banana candies were placed on white serving platters, while the yummy banana split cupcakes were perfectly placed on the candies for the greatest dessert presentation! 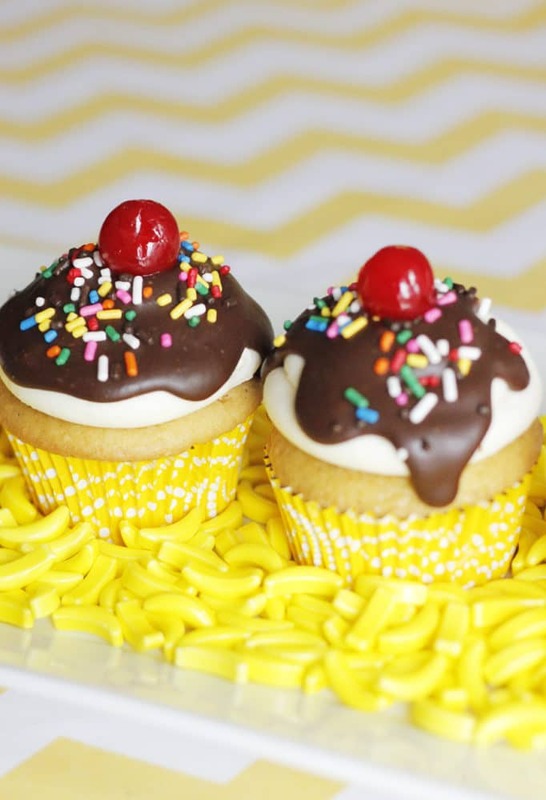 The banana split cupcakes with chocolate ganache were to die for! They were seriously the best cupcakes and were a total hit with kids and adults alike! 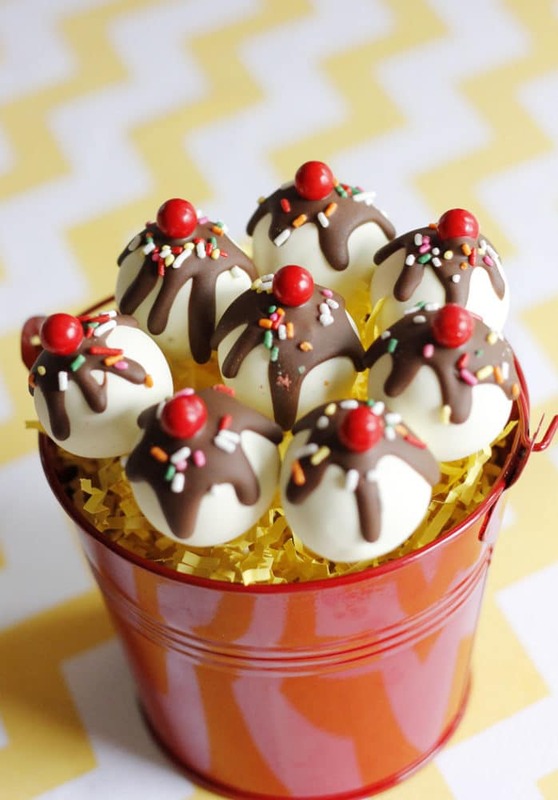 The banana split cake pops from Autumn Lynn’s Chocolate Sins were also a huge hit! How perfect are these? They looked great on the dessert table next to the delicious banana split cake cupcakes with chocolate ganache! Party guests satisfied their sweet tooth with chocolate covered Oreos topped with candy bananas and Rice Krispie Pops from Sweet U Off Your Feet. There were also red macaroons from Sweets & Treats Design Studio and chocolate covered pretzels and cookies from a local market. Vanilla cupcakes with vanilla frosting and sprinkles were topped with coordinating cupcake topper printables. 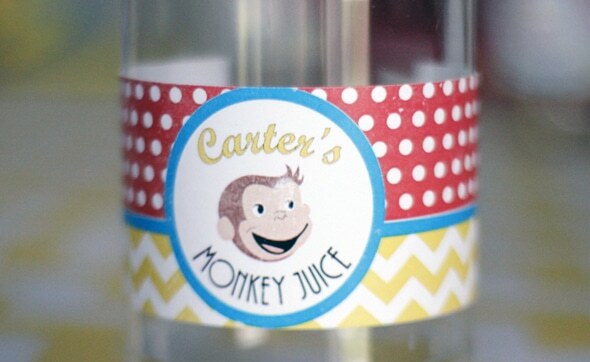 After all of those sweets, guests were able to wash down all of those goodies with some “Monkey Juice.” How adorable are the personalized drink labels and drink flags? What a perfect added detail to this super fun Curious George Birthday! 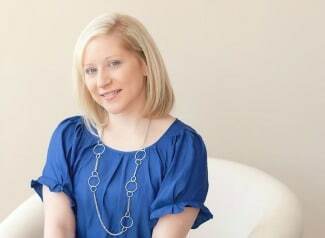 Another great party idea is to have guests sign a birthday canvas from Canvas Kudos. We just love this idea! It makes such a great keepsake! The birthday boy can keep this forever and know how much he is loved and what a great third birthday party he had! The kids took home a treat bag full of chocolate candy (Not like they didn’t have enough at the party … sorry parents!) 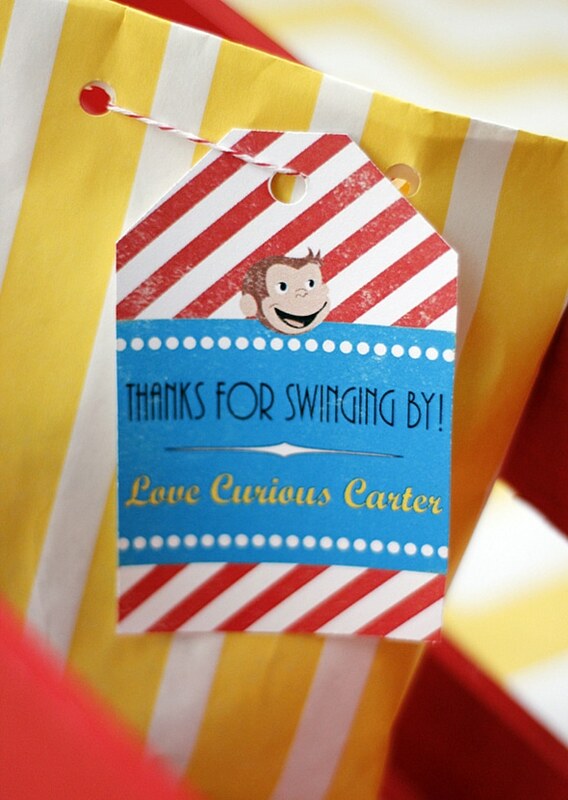 A printable tag with “Thanks for swinging by” hung on the favor bags with twine. What a great time monkeying around at this fun Curious George Birthday! What’s your favorite detail in this Curious George Birthday Party? Let us know in the comments below! Oh Cristy his party is absolutely adorable! I love the color scheme and the use of the lil banana runts candy is too cute, and I think the canvas a guest book as a fun keepsake / wall art is just fabolous! so, so , SOOOOO CUTE!!!!! That’s so fun! I love this theme! It was fabric and I believe it was from Joann Fabric or Hobby Lobby. That is a great party set-up – very intricate and with great attention to detail.